JET3up at work: When printing, two deflection electrodes come into play. They change the trajectory of individual drops, so that they land as a pixel on the product surface and dry within one second. Binder + Wöhrle is convinced that inevitably, the time comes for even the most tried and tested technology to retire. The manufacturer of plastic pipes, profiles, and Bowden cables, which are used in cars from VW among others, has said goodbye to its old hot stamping machines for product marking. CIJ printers from Paul Leibinger GmbH & Co. KG are now being used instead. 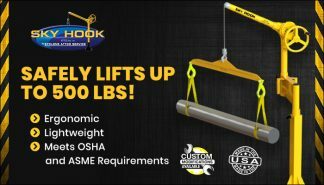 They are more flexible, faster and do not directly touch the products. Are you familiar with Bowden cables? Maybe not by name. But if you ride a bicycle, then you are making use of the cables that Englishman Ernest Monnigton (1859-1904) invented. They transmit tensile and compressive forces and are also used in motorcycle and car gas and clutch cables – in the seat adjustment and hood opening mechanisms. What very few people know is that one of the leading manufacturers of plastic pipes, profiles and Bowden cables is located in the Black Forest, in Hausach near Offenburg, Germany. The tranquil town with only 6,000 inhabitants is home to Binder + Wöhrle, easily recognizable from a distance with its white-red headquarters and more than 8,000 square meter production plant – in striking contrast to the green forests of the surrounding area. Over three shifts, 60 employees process more than 800 tons of wire per year. The company achieves a yearly turnover of over eight million euros and counts well-known companies such as VW among its customers. As one of the technology leaders in plastic pipes, profiles and Bowden cables, Binder + Wöhrle strives to be at the cutting edge of technology. And this is why old technologies regularly give way to state-of-the-art solutions: an example being the hot-stamping machines which were used for product marking. They did a dependable job for years, printing pre-heated embossed marks on plastic sheets that peeled off and stuck to the product as a typeface. The hot stamping machines could be operated economically – but only at a time when little data had to appear on products. “Today things are very different,” explains Klemens Isele, Managing Director of Binder + Wöhrle. “We are required by law to provide a variety of product data – including product number, material identification and production date.” The hot stamping machines, which made changing typefaces quite time-consuming, have reached the limits of their flexibility. And this is why Isele went in search of a cost-effective and flexible labeling system. In order to find the right labeling system, Isele did not even have to leave Baden-Württemberg. In fact, he found the perfect solution not far from home. In neighboring Tuttlingen, there is another world leader, not in Bowden cables, but in industrial marking systems: the Paul Leibinger company, founded in 1948. It produces the JET3up, a printer that meets Binder + Wöhrle’s requirements to a T. Since information is not fixed as in the case of a hot stamping machine, but rather it can be changed within seconds – five-line small fonts, graphics, barcodes and all common data matrix codes with a print height of up to 16 millimeters included. “With these printers, we are now able to label our products faster than ever and can implement product changes even more quickly,” says Isele. Information can be adjusted using a 10.4-inch touchscreen that is as easy to use as a smartphone. It’s the what-you-see-is-what-you-get (WYSIWYG) principle at work. The set information appears one-to-one on the product, all without nerve-wracking test runs. Another advantage of the JET3up is that, unlike with the hot stamping machine, the printer does not actually touch the product. This allows quick marking, which is gentle on the product and reduces the risk of breakage. The secret of this non-contact marking is a technology called Continuous Inkjet (CIJ). It works within the cylindrical printhead, which looks directly at the product from above, and runs out of the extruder at a speed of around 200 meters per minute. In the printhead, which is connected to the hydraulics in the printer housing via an umbilical, 96,000 charged drops of ink per second shoot through a tiny nozzle in the direction of a collection pipe. 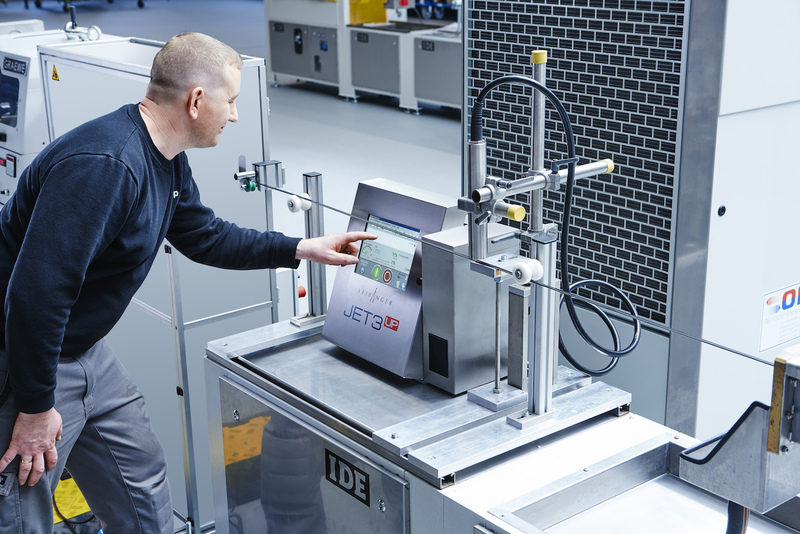 JET3up: The CIJ-Printer prints five-line small fonts, graphics, barcodes and all common data matrix codes with a print height of up to 16 millimeters included. The printers even have power reserves. They can keep up with speeds of up to 600 meters per minute – equivalent to 36 km/h. And it is always possible to increase line speeds without the marking systems causing a bottleneck. Thirteen printers are now being used at Binder + Wöhrle’s production facilities. Not only in the Bowden cable production, but also in the production of pipes and hoses – another one of the company’s business areas. Paul Leibinger GmbH & Co. KG from Tuttlingen, Germany, founded in 1948, is a specialist in industrial marking solutions. The company develops and manufactures continuous inkjet printers, numbering machines and camera verification systems to monitor a smooth production flow. As a third-generation, family-owned company, Leibinger employs close to 250 people at its sites in Tuttlingen, Baden-Württemberg in Germany, and at the East Troy subsidiary in the United States. With more than 150 certified sales and service partners, Leibinger is represented in all markets worldwide.